This year marks the 30th anniversary of People Against Racist Terror (Anti-Racist Action-Los Angeles), founded in 1987 to protest the L.A. appearance of Birmingham church-bomber J.B. Stoner, as a grassroots anti-racist, anti-fascist and anti-colonial organization. To mark the occasion, there will be a political-cultural event to benefit the group's publication, "Turning The Tide: A Journal of Inter-communal Solidarity," which has been distributed free to prisoners since 1988. 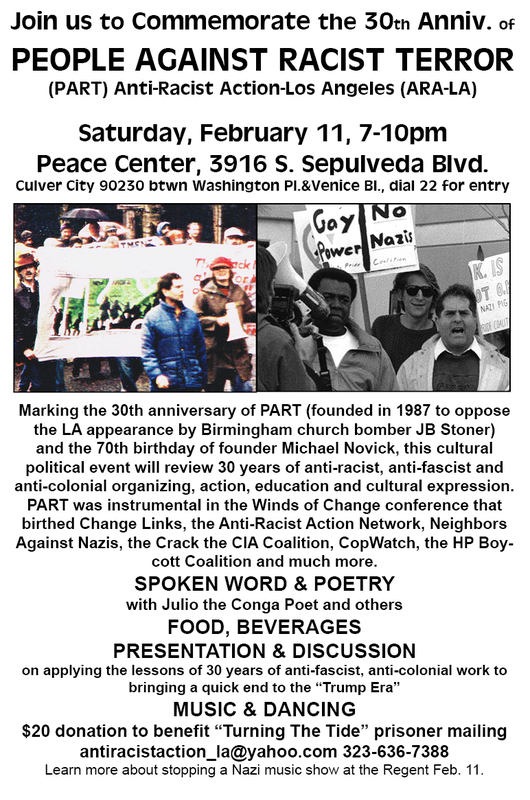 The event will feature spoken word/poetry, including by Julio the Conga Poet, a presentation and discussion about applying the lessons of 30 years of anti-racist, anti-fascist action, research & education to dealing with the Trump regime, by PART founder and TTT editor, Michael Novick, along with food, drink, music, dancing and a chance to socialize. A donation is requested to benefit TTT, sent free to over 1700 prisons quarterly and distributed locally and nationally by Anti-Racist Action and antifa network chapters. The anniversary commemoration will be held at the Peace Center, 3916 S. Sepulveda Blvd., Culver City CA 90230 (between Washington Pl. and Venice Blvd. ; free parking in rear or next door at Pauline Books, dial 22 for entry) on Saturday, February 11, from 7-10:00 pm. It also marks the 70th birthday of TTT editor Michael Novick, who just completed his tenure on the KPFK Local Station Board and Pacifica National Board.